Val and I recently missed a property that is next door to one of my current properties. I will summarize the events as this all went down over a couple of months with numerous talks and discussions with the seller(s). 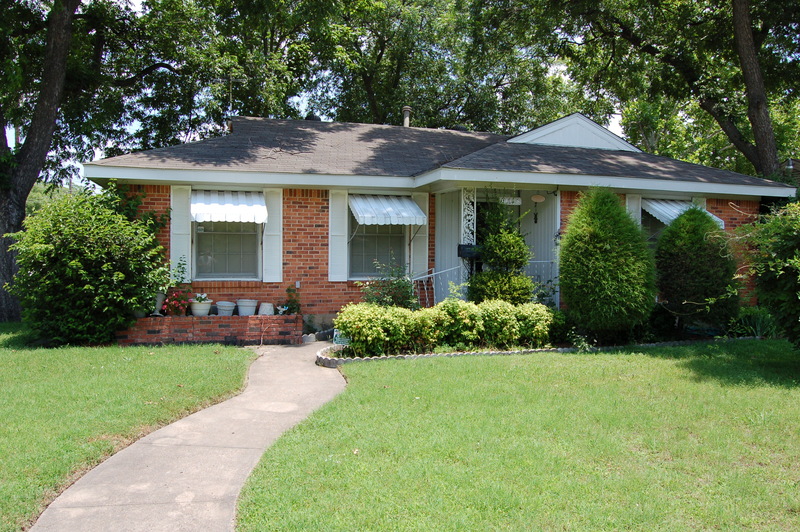 The property is in a Class C neighborhood and was built in the 50’s. 2 bedroom, 1 bath, 1 car detached garage. For the last 30 years an older lady has lived there by herself (actually w her husband before he passed over 10 years ago). Long story, but she was ill and family moved her to an elder care facility. I talked to my current tenants (next door) and other neighbors and was able to get the phone number to the family. I called them and they were interested in selling but were not in a hurry and working on the title. I was talking to an aunt, but one of the closest relatives that did have full power of attorney. I viewed the home with her and understood all of her concerns. She essentially wanted top dollar, wanted to get family heirlooms and belongings, and wanted cash. None of this was a problem for me so I put an offer together. There was some discussion around the offer amount and we were not that far apart. Things were coming together smoothly. One issue that kept coming up was the belongings in the house. There was a lot of collectibles, old furniture, all kinds of nick nacks, etc. Every closet and room was full of stuff, two storage sheds were completely full, and the detached one car garage was full as well. Fast forward again… I offered to pay them for all the belongings. 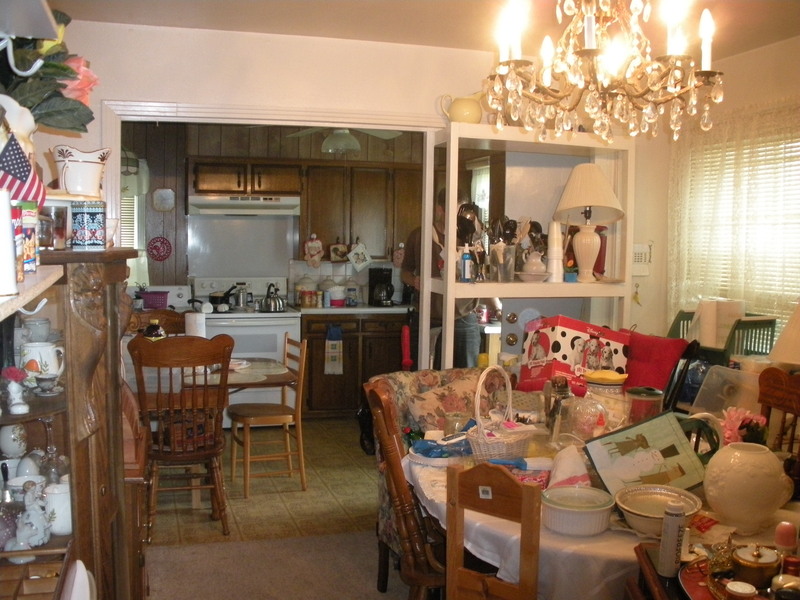 My plan was to take it all, and then hold an estate sale – have a salvage company come in at the end, etc. This just opened up another issue of what was it all worth . I really didn’t care about making money on the belongings – I just wanted the house. We kept hitting road blocks with the belongings – I offered to move all of the belongings to a storage unit and pay for the storage unit for up to 6 months. Still no go… I offered for them to host an estate sale and keep all the money – Here again I stressed I just wanted the house. All of this talk about these belongings really stretched things out. All this time they have not listed the house or even put a FSBO sign up. There never really was a sense of urgency. Fast forward some more – I actually had a text message agreeing on the purchase price – and we had a plan of action on the belongings. I immediately sent her a sales contract. Then 2 days after that text the older lady that lived in the house passes away. Now the Power or Attorney is dead – the ownership switched to a trust – NOW I have 3 parties to deal with. The deal just went upside down from there…. I pushed through for a while and had 2 of the 3 parties on my side. The last holdout just wanted more money. I could not keep him from putting it out on the market. He wanted 40% more than my offer – he got almost 30% more. This was a frustrating process and loss. However, I did offer the absolute most I was wiling to pay. I wanted to be sure I did not regret offering more as I have lived this scenario before. I know I have not posted in a few months.. We have been very busy lately. Val and I have both recently changed our day jobs.. Still at the same companies, but changed roles. It takes additional time up-front in a new role to get to a steady state. (Guess it’s like the rehab on a new property to get it rent ready). Anyhow we are at steady state now. We have both been paying down mortgages and hoarding cash as well. This has us both getting the itch to pick up another property so we have started prospecting some lately. I must say this market in the Dallas area is amazing. Home values are really moving up. Properties are moving quickly and there are still lots of investors buying even as values continue to climb. We are REALLY glad we bought when we did. In the mean time, rents are still going up too – so we know we will be paying more as well. I have put in a couple of bids lately and we were not even close on market listed properties. Even homes we find from wholesalers are selling to newbie landlords and flippers for way more than we would pay. The Spring/Summer season is tough as everyone is out there shopping. Our new strategy is to not compete. How do you do this? You find the FSBOs or the sellers that want to sell that have not even put the sign in the yard yet. These are harder to find, but they are out there. I will post a bit about some of the properties we have missed out on lately. I got some good feedback on those posts earlier. FYI.. 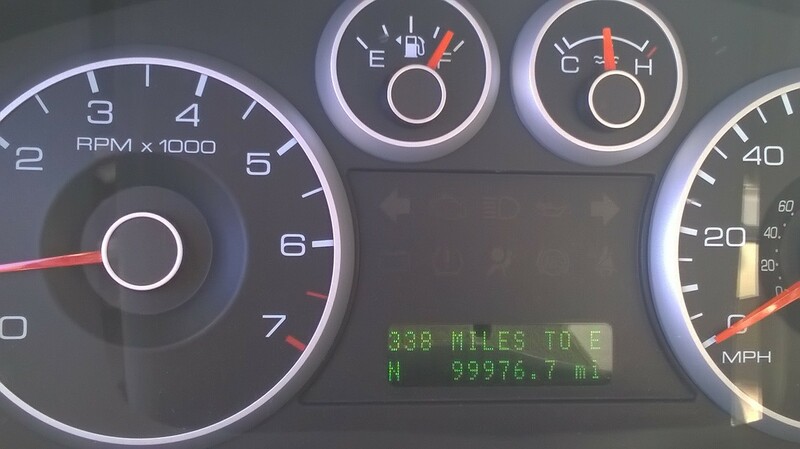 I hit 100k on my used 2008 Ford Fusion. I like that I hit the milestone while prospecting for a new property. Might go with a truck on my next vehicle. 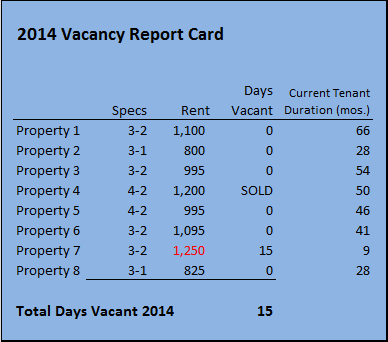 Here is the annual vacancy report card for our properties in 2014. We are delighted with the success we are having with tenants. The one vacancy in Property 7 went really smooth, we raised the rent from 1,135 to 1,250 and we only lost about 2 weeks rent. I updated the column on our current tenant duration again this year – Truly amazing. I earlier said I want to get 30 months out of a tenant. We are exceeding that on average for sure. Our strategy of heavy tenant screening, below market rents and keeping the condition slightly above average is certainly working. I can’t help but think there is a 4th factor involved here – I think the personal touch of self-managing and jumping on maintenance issues when they arise is helping us as well. Val and I both have a rolodex of help and make calls right away when issues arise. We also did our tenant Christmas gifts again this year ($20 Walmart gift cards). I don’t think this is what keeps them in there, but I don’t see a down-side. Given how quick we filled our vacancy this year, I also believe the limited availability of rental homes (and the jump in values of homes for sale) in our current market has people staying put for now? How did everyone else do this year? Any success or horror stories? In my last post, I mentioned I was going to define how I spend “quality” time at my rentals. When I have a vacancy, which is few and far between, I will spend the entire weekend or several weekends in a row at the house. I love doing most of the work myself, with my husband and my daughter. Plus it’s a great way to save money – keeping more of the rent in my pocket. In between vacancies, which is the majority of the time for me, I spend more of what I would call ” quality time” at the rentals. Things like this save me money and offer great service to the tenant. And by the way, a tenant has never called me at 2 a.m. for any of these (or anything else). Below are 3 recent examples of service calls. If you notice at the core of these is really tenant education. Given the long-term nature of most of our tenants its worth the time to educate them to be better tenants. 1. Tenant calls complaining of backed up toilet. I will drop by after work with plunger in hand to work on it myself to decide if I need to call my plumber or my handyman, or neither one. Most of the time, my plunger works and I just saved myself $. I have found that many tenants who come from apartments would never dream of plunging a toilet themselves and do not even own a plunger. At their apartments, they just made a phone call and the maintenance man came running. 2. Tenant complains that back door will not lock (or will not unlock). This is typically caused from the house shifting. After work, I take my tool box and my chisel and look at it. Once there, I see the deadbolt is just missing clearing the lock hole by a very small fraction. In about 5 minutes I had the door locking again without unscrewing anything. I would have called my handyman out on this one so I saved myself about $25 and called it a day. 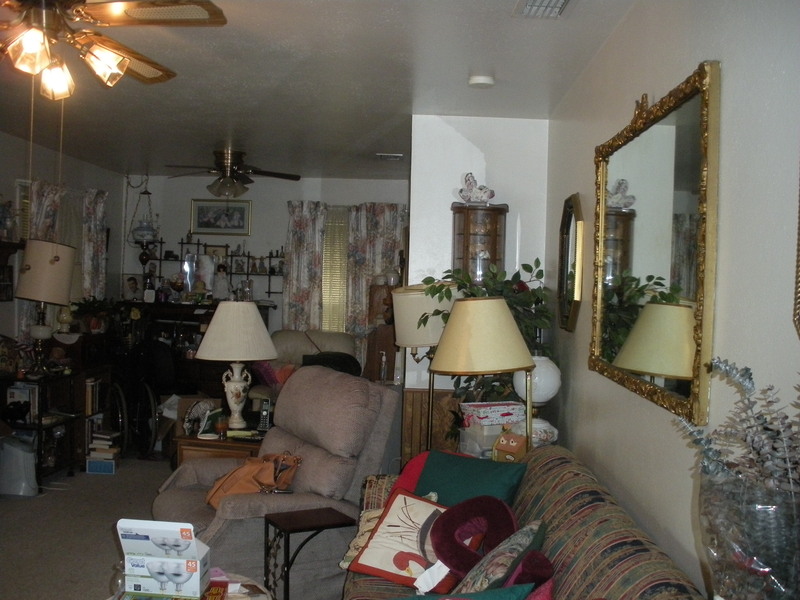 Even better, the tenant is an older man and loves doing things around the house himself if he is able. He watched what I did to the door, and I have never again received a call about that issue again because the tenant is repairing it himself! It’s a win-win – for the tenant and me! 3. Tenant calls complaining of ants in the house. A stop by after work and inspect it. There appears to be a few ants in the kitchen area and a heap of trash that needs to be taken out. No wonder they have ants! I bring them a can of ant spray from Wal-Mart and advise them to take out the trash. I spray around entry doors and windows and have never had that call again. This saved at least $100 for pest control. Either they don’t have ants anymore or don’t want me advising them to take out the trash! My husband and I have many examples like those above, where we have spent a small amount of time at the rental that ended up saving us quite a bit of money. This is what I call quality time indeed! 1. Keep the rent below market for the area. This ensures that my tenants will not find a lower-priced rental house in my area, so they don’t look. They know a good deal when they see it, and they know they have a good deal. The first house that got me into the rental business taught me this lesson, and that house has never turned over since I first leased it. The fewer vacancies I have means the less work for me (and more money). 2. Never raise the rent while the current tenants occupy the house with good payment history. At lease renewal time, I emphasize to the tenants that their good payment history has earned them no rental increases for the coming year. After I do this for several years, tenants get the picture – they pay the rent on time. However, if they don’t have good payment history I know exactly how to get them to move. Again, my goal here is fewer vacancies which equates to less work for me. 3. Never mow, edge, weed eat, take the trash to the curb, or do anything at the rentals that the tenants should be doing themselves. If it goes without being done after multiple warnings to the tenants, hire someone cheap to do it and charge the tenants for it. This might mean taking it out of their security deposit when they move out. You will not ever see me mowing my tenant’s yard on a Saturday morning while they sleep in. My husband has been known to take his weed eater over “real quick” just to knock down the “tall stuff”. He comes back 3 hours later, exhausted, weed eater in pieces. [Um…Yeah no comment…] The moral of the story – hire it out. I do not spend my weekend doing my tenant’s yard work. If I want to do yard work – I do it in my own yard. Now all of this does not mean I never spend time at my rentals. In my next post I will tell you how I spend what I would call “quality” time at my rentals, and I spend the rest of the weekend doing what I want to do with my husband and family! So I have been having an issue with one my tenants for the last several months. I will sometimes commit a “landlord sin” in the hopes that in the long run it will work itself out in my favor. Sometimes it does, other times it does not – Time will tell. I allowed a tenant to make partial rent payments for a couple of months until they got back on their feet from a couple of issues. This is already a RED flag, but these tenants have been with me for 23 months, keep the place clean, get along with the neighbors, and are very respectful. These tenants are a young couple that were having car troubles and fewer hours on one of their jobs. I immediately wanted their plan for how they were going to get caught up as this scenario could snowball. She said they need to pay mid-month for a couple of months until they got back on their feet. I was really busy at work and as you know we self-manage. So – I tentatively allowed this with no late charges. Well two months ran into three. At this point he had a new job and the car was back on the road. But the “landlord sin” was already committed. Once you allow late rent with no penalty, tenants will take advantage of it. These are not “Pacific Heights – Professional Tenants” – they are just taking advantage of my lack of policy enforcement. So do I boot them out? Not yet. I consider this as much my fault as theirs. I reset expectations by meeting with them at the house. I typed up a one page document and titled it “Late Pay Policy Reminder”. I essentially came in and said look I worked with you guys through some tough issues. I think you will agree that I have been more than fair with you. However, I now need to start enforcing the lease policies. I need you to start making rent the priority. One good thing about young tenants is they are trainable. I told them I am not enacting any new policies with this document – these have always been in the lease. I handed them the document and explained that it outlines the late policy and the associated fees(I actually cut and pasted the late policy into the document). I also reminded them that they are on a month to month lease and they or I can terminate the lease with 30 days notice (also pasted the month to month section of the lease agreement into the letter). I took it even further and reminded them that I could increase the rent at any time with 30 days notice. I then told them if you can get back on track, I have no intention of raising it anytime soon. I signed it and had them sign it as well. I will follow up by mailing this to the house (conveniently a few days before rent is due). Their reaction to this was just what I was looking for. “I understand, yes sir. We are going to get caught up on this. We don’t want to move. We appreciate you working with us. etc.”. I was driving by one of our rentals last week and caught a For Rent sign in the yard with an open house sign next to it. I like this strategy when you are making final tweaks to a property and you are going to be there all day — Go ahead and put an Open House sign next to your Rental sign. As most of my vacancies are filled via my sign in the yard, this is a good way get tenants to view your property, get some apps filled out and get some feedback on the house. Technically, other rentals in your neighborhood are only competition if they are vacant at the same time yours is. Nevertheless, any time you get a chance to tour another rental – DO IT. This is your best way to comp your property. You can check the MLS and various other websites, but current rentals in your neighborhood is your best comp. This is also a good opportunity to talk to another landlord. Ask about their application process, income qualifications, late charges, move in policy, pet policy, etc. I want to understand what my competition is doing and I always seem to learn something useful in the process. It is interesting to “put the shoe on the other foot” and understand what your prospects are going through as they are viewing your property. This particular property was in terrible shape. No fence in the backyard was a big problem in my mind. It had a 2 car garage in which they had built out one half and left the other. The build out had wood paneling, a low drop down ceiling, very dark, bad AC vents, etc. They forced a closet in one corner, so they justified it as a bedroom. The bathrooms were nasty, the house needed paint, spots on ceilings, spots on the carpets, missing light fixtures, leak spots under the sinks, missing door hardware, damaged doors, etc. It was an all-around rough property. They were asking less than market rent, but not a lot less. Another interesting thing to watch is how long that sign is in the yard at the given rent rate. I also take the opportunity to find out what other homes they have in the area. I will take note of which properties in my neighborhood are rentals and also try to keep track of who the owners are. These could turn out to be good leads on future purchases. Anyone else do this sort of window shopping in your farm areas?